This class contains the information about one mathematical expression from an sbml model and how it relates to units constraints. Definition at line 131 of file CSBMLunitInterface.h. Definition at line 159 of file CSBMLunitInterface.h. Definition at line 150 of file CSBMLunitInterface.h. Referenced by CSBMLunitInterface::debugOutput(), and CSBMLunitInterface::handleOneExpression(). display name of the object that either contains the expression or the the expression applies to. Definition at line 156 of file CSBMLunitInterface.h. Definition at line 138 of file CSBMLunitInterface.h. 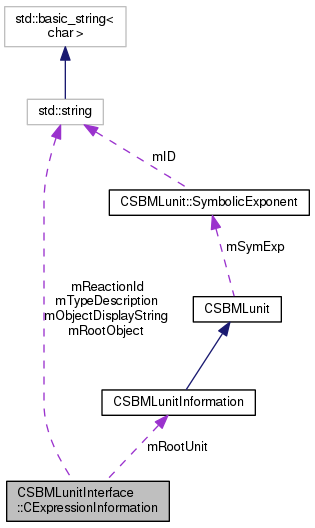 Referenced by CSBMLunitInterface::debugOutput(), CSBMLunitInterface::determineUnits(), CSBMLunitInterface::handleOneExpression(), and CSBMLunitInterface::initializeFromSBMLModel(). Definition at line 135 of file CSBMLunitInterface.h. Definition at line 147 of file CSBMLunitInterface.h. Definition at line 141 of file CSBMLunitInterface.h. Definition at line 144 of file CSBMLunitInterface.h. this indicates the origin of the expression for display purposes, e.g. "kinetic law"
Definition at line 153 of file CSBMLunitInterface.h.